As with the other sections of the garage, before we can recommend a storage solution, we have to assess a client’s garage, house size and what space they have available. We take a look at what is currently found in the garage and ask the client if there’s anything else they would like to store outside of the house. Lack of storage space is a universal complaint. It seems that no matter how much space we have, we can always use more. 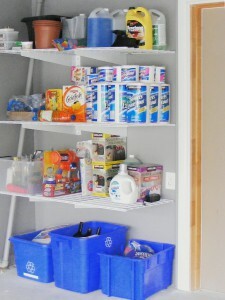 The issue is that while you want to have cleaning supplies as well as cases of water and pop close at hand, they can be hard to store in an organized manner without the proper storage solution. Mudrooms and basements are commonly used for storage because they keep bulky items out of sight. The problem with a mudroom is that if things are hidden behind coats and boots, they’re hard to get at. With a basement, you’ve got to carry something bulky and heavy down the stairs first, then up the stairs when you need it. Keeping these things in the garage makes more sense because they can be kept on shelves near the back of your garage, which is usually by the kitchen or entrance, reducing the need to truck these things all over the house. This makes it much more convenient to have access to what you need. Under normal conditions, pop and water won’t freeze in an enclosed garage, so that shouldn’t be a concern. 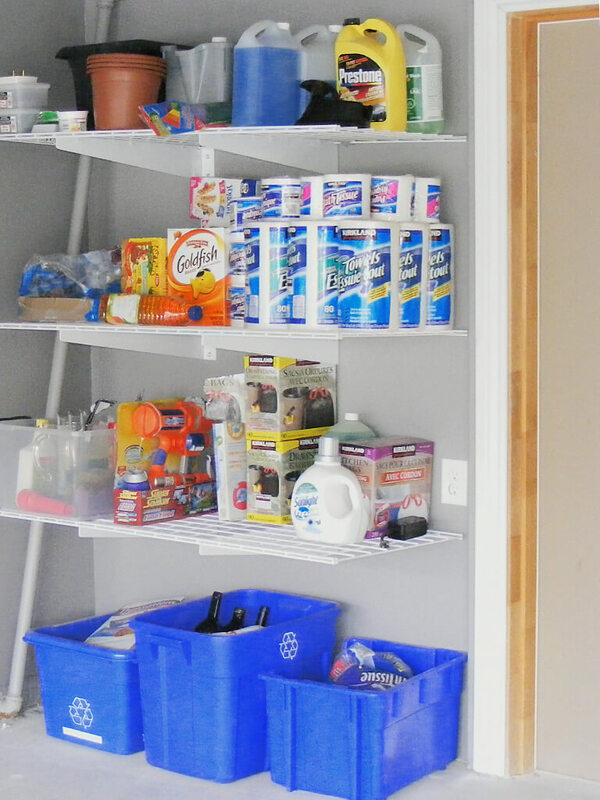 When it comes to household items such as cleaning supplies and garbage bags, while they don’t take up a lot of room, it’s important that they’re well organized and easily accessible. Cabinets are a good option for items like these and other things that you don’t want to have to see every time you go in your garage. 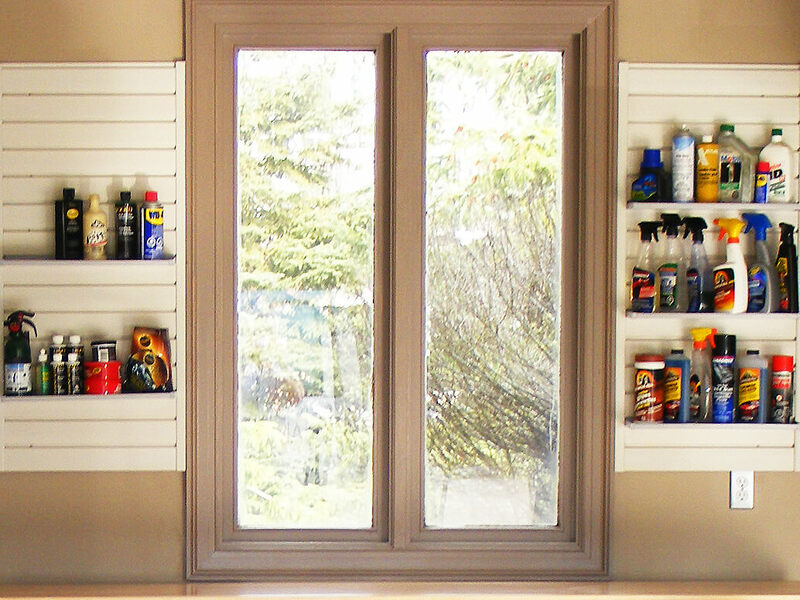 Keeping chemicals away from kids and pets is important and usually not an issue in the section of the garage as they can usually be stored above the recycling centre, keeping them far higher than little hands can reach. 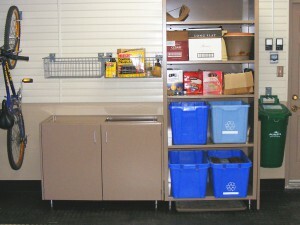 The cabinets will also keep products used for external cleaning handy, such as leaf bags.